This is a standalone recipe, but its result is an inedible dough. There’s really not much to it, mix together flour eggs salt and a bit of water in a food processor, then add water by drops until a dough just forms. Kneed for 15 seconds, and leave it alone covered for a hour. A good recipe to have on hand, and a lead in to many other recipes, but on it’s own it’s just dough. I’d never made pasta before, and the eventual rolling and cutting it into shapes part was really fun. 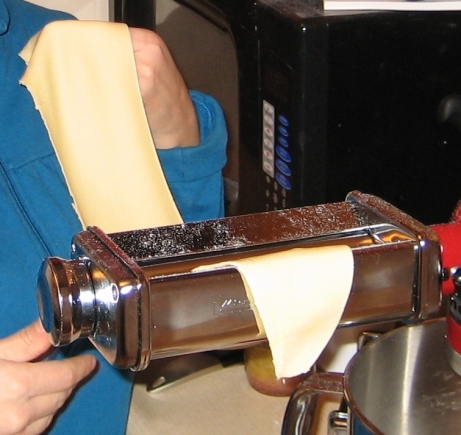 I went a bit hog wild with the pasta roller and made streams of fettuccine, ravioli, and dumplings after I learned how much I enjoyed it. The recipe worked reliably and produced some fine tasting pasta. The only trick was to cover it well while it rests. It’s a very dry dough, and if it’s left in the air for too long it drys and cracks when you try to roll it. I don’t eat a lot of pasta, and when I do it’s usually because I want something simple and fast. There’s something very appealing about forcing yourself to slow down and appreciate the steps that go into pasta. The textural differences between fresh and dried pasta are fairly subtle, at least to me, but as it’s a good time I say why not make it yourself? The real advantage of homemade is in stuffed pastas. Making your own ravioli is worth every second of effort. This dough was a gateway to all kinds of good dinners, it’s easy, and it’s reliable. It’s not exciting, but it doesn’t need to be. You heard it here first. Dough is a gateway food. Well played Nique. You had me giggling all morning. Highly rated post. I be taught one thing completely new on totally different blogs everyday. Deciding on one . stimulating to read the paper content material from different writers and be taught somewhat one thing from their website. I’d like to use certain of this content on my blog your’s mind. Natually I’ll give a hyperlink right here we’re at your web-site. Admire your sharing.